The English language is nobody’s special property. It is the property of the imagination: it is the property of the language itself. The English language, and we imagine all other languages, is a constantly evolving body of work. We create new words, we combine words, and we change the meaning of words to suit our every whim and vagary. Just look at the word Babe, it first found its way into the English language in the late 14th century, deriving most likely from the word babble, it began to be used to mean a childish person from around 1520 and only took on probably the most common modern form, meaning “attractive young woman” in around 1915. You only need look at a list of the words that entered our vocabulary in the last fifty years to see how they can spread like wild fire, words like detox, feminism and goth didn’t even exist as we know them, yet now it’s hard to imagine a world without them, even if goths don’t seem as common as they used to be outside of Camden. Music has always had associations with fashion, social movements and literature, so it is perhaps unsurprising that the language of music moves at a rapid rate, terms from bangin’ to hip-hop, brit-pop to garage simply didn’t exist until someone coined the phrase in the very recent past. A fact worth considering next time someone makes up a new genre, electroclash, nu-rave, shoegaze they were all just stupid made up phrases, and now, well they’re still just stupid made up phrases, but ones that have someone attained a meaning along the way. The advent of computers and mobile phones has brought on an entire new evolution of the way we speak, the youth of today are empowered with the freedom to communicate however they feel. people can complain about text speak and the misuse of the English language all they like, but ultimately language only exists because it evolves, time to accept that language has no rules only guidelines, and it’s not us old buggers who decide where it goes next. Total Babes is the brainchild of Jason Gerycz of Cloud Nothings and good friend Christopher Brown, no not that Chris Brown thankfully! They’re joined on their latest album Heydays by bassist Nathan Ward and John Elliot on synthesisers. Driving guitars with a tendency towards the jangling, solid, heavy hitting drums, the gentle low end rumbling of a bass and a rich variety of synth sounds, plus on their sophomore albums second single Circling there’s even room for honking saxophone breakdown courtesy of Cloud Nothing’s Dylan Bardi. Total Babes formed in Medina in Ohio. Medina was home to famous Bee Keeping pioneer Amos Root, creator of the emoticons Scott Fahlman, and Jackass member Ryan Dunn. Extensive research has drawn a blank on bands from Medina though, so we can conclude Total Babes are Medina’s best band! 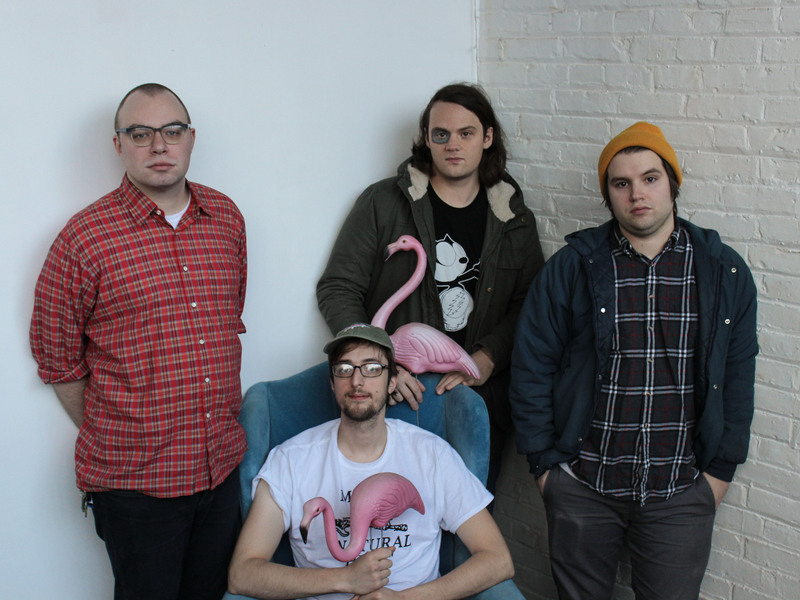 Total Babes formed back in 2010 as a vehicle for the poppier side of Jason and Christopher’s output that didn’t fit into the style of their noise-rock outfit Swindella. They released their debut album, Swimming Through Sunlight, back in 2011 on Old Flame Records. Jason’s success with Cloud Nothings, has meant it’s been four years in the making but the follow up, Heydays will finally be released on Wichita Recordings May 18th. The album may only just clock in over the half hour mark, but it feels even shorter such is the blurring quick pace of the album, it’s reminiscent of Chorus the album put out by Literature last year and just as great. Packing in a huge variety of reference points from the C-86 big book of jangle pop, and crafting some well honed hook-laden tracks along the way. Blurred Time is perhaps unsurprisingly a blur or sound, rapid chugging guitars, rolling toms and some mighty riffing, it brings to mind the scuzzy-pop of Deerhunter or No Age. We’ll Come Around carries the same easy going jangling-pop vibe perfected by The Pains Of Being Pure At Heart or Real Estate, whilst Can I Turn You On, has a melody that sounds like it’s been lifted straight from No Doubt’s classic Just A Girl. They’re no one trick ponies; they even try their hand at folk, the intro sundrenched, blissed out Repeat Gold sounding not unlike Fleet Foxes or Vetiver before the drums and a gorgeous pallet of synths lift us into Beta Band territory. However, Sunny Side is the biggest departure from their day job, a lilting piece of piano music that wouldn’t sound out of place in the work of Yann Tiersen or Nils Frahm, if it were slightly more polished. As it is it’s a delight, and a perfect moment of calm in the hectic pop tinged world Total Babes have created. There’s a simplistic joy to these punk tinged pop songs, and if you’re looking for a musical revolution you won’t find much new here, not that it in anyway stops Heydays being an absolute blast, a joyous rush of unpretentious good times!